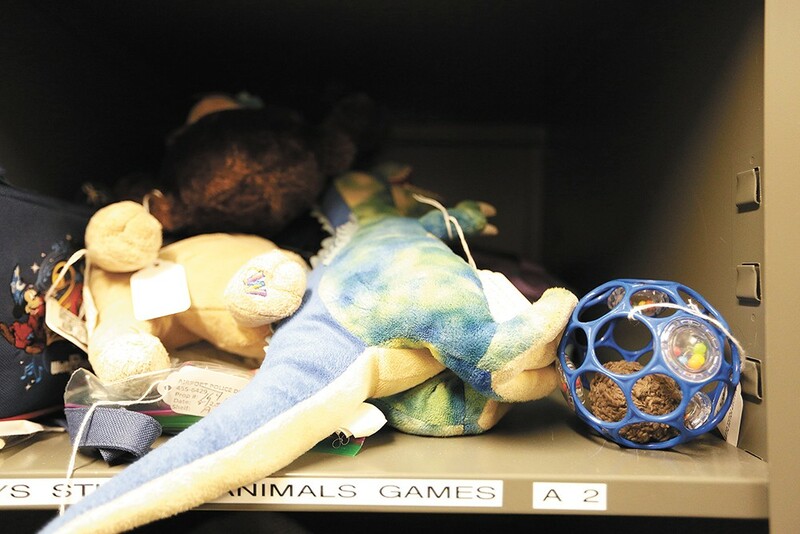 The Spokane International Airport's lost and found has received about 6,000 items this year alone. This is the land of lost things. Danielle Steel and George R.R. Martin paperbacks converge with clear plastic bins stocked with reading glasses and single gloves. Hanging Gore-Tex jackets and silkscreened sweatshirts share the stale air with left-behind suitcases and strollers. When abandoned/forgotten items are found at Spokane International Airport, they're taken to the Airport Police Department office. Items are logged for the record, sorted and then placed in this beige storage closet, only slightly larger than a single-stall bathroom. "I don't know how you leave your cane behind," says Airport Police Chief Peter Troyer, pointing to the silver walking stick in the corner. "That seems important." Troyer, along with Marketing and Public Affairs Director Todd Woodard, are showing off the contents of the room today. They've seen all sorts of items come through over the years — including the confiscated weapons and drugs (BB guns, switchblades and undocumented pot) that people try to sneak through the metal detectors. This year, only about 28 percent of the items turned in by airport workers or travelers were spoken for. Troyer says they work especially hard to return important things like credit cards or cell phones (most have a "mom" in their contacts to help facilitate the return) or expensive prescription medications. "People are so happy to have their stuff recovered," says Troyer, sorting through a container of phones. "They think it's gone forever, but it's been here the whole time." You'd be surprised how many things people leave behind. In the bustle of the airport, where running late and waiting in long lines can bring on stress, people forget to slow down. They leave their freshly purchased People magazine on a chair or their iPhone next to a sink. So far this year, the airport lost and found has received around 6,000 items. This isn't the only place where we leave things behind; there are lost-and-found collections and databases scattered throughout Spokane and beyond. Continuing to keep track of these misplaced items (much of which could be considered junk) not only shows just how forgetful humans can be, but also reinforces our profound sense of hope that lost items may not be so lost after all. The airport organizes lost items in the hope that owners will return to retrieve them. Say you're at the downtown River Park Square food court on a lunch break when you receive an urgent phone call. While still talking, you gather your belongings and head out, leaving your wallet behind. What's occurring in your brain is something called inattentional blindness, says Danielle Sitzman, an assistant professor of psychology at Eastern Washington University. It's not that you're physically blind; your mind just isn't letting you see things clearly. The wallet could be right in front of you, and it doesn't register. "When you're talking about this stuff we leave behind, it's probably more of an inattention issue. We're not good at multitasking," says Sitzman, whose doctoral research was in human memory. Sitzman says that in public we're more hyper-aware of our situation, but there's also a lot that's out of our control. People leave things all the time at River Park Square, says Marketing Director Elizabeth Mills. Sometimes shopping bags full of new items, and also dirty pairs of shoes. Mall employees and fellow shoppers turn things in to the concierge desk, where the lost and found is located. "Usually people come back here in a panic," Mills says. The mall estimates about 80 percent of items are retrieved right away, but if things aren't picked up within three months, they're donated to the Union Gospel Mission. The nicer clothing goes to the YWCA's My Sister's Closet (to which the mall brings public donations). "This is what makes us part of downtown, finding items left behind from people of all walks of life," Mills says. "You have to embrace it." Finding something on the Spokane Craigslist lost-and-found page is a crapshoot. One site poster wants his maroon bowling ball back, no questions asked. Another South Hill parent hopes their child's Elsa doll can be returned as soon as possible. Most of the listings involve missing pets. But Luke Schlining is in the business of helping people find their expensive metal items. And as his Craigslist post says, he'll take a stab at finding your missing engagement ring for free. "I don't want people to call me, to be honest," Schlining says. "That means something important is lost." The metal detecting enthusiast has looked for metallic treasure since his teens, but about four years ago he stumbled upon the Ring Finders website, first started in Canada. Now the 30-year-old Spokane Valley resident is one of the American Ring Finders searching for people's jewelry in their backyards or a snowbank, or off the side of a boat (he's scuba certified). "In water and beaches, it's a needle in the haystack. You have to know what you're doing," he says, admitting that plenty of times his searches come up short. But Schlining continues to volunteer his time and metal detector, because when it does work out, the reward is invaluable. "I'm meeting tons of nice people through this," he says. "It's my way of giving back to the community." When it comes to your precious jewelry, his best advice is never to take off your rings. "That's when people get into trouble, every time," he says. Kids, by nature, are forgetful. So it makes sense that the lost and found in the front hallway of Jefferson Elementary School has been well stocked since the first week of September. Principal Nikki Golden says her staff assumes students will leave things behind, and teaching kids how to be less forgetful is built into the curriculum — including checking lockers at the end of the day and writing tasks down in planners. "The younger kids especially, they're just so excited to be outside playing or involved in a game in gym class that they easily leave a coat behind," Golden says. 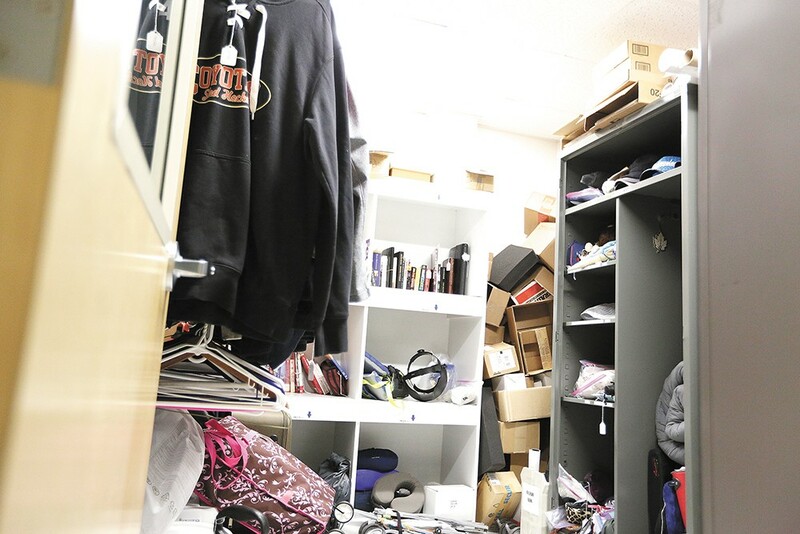 The well-organized black metal rolling rack, which serves as the lost-and-found station, includes fuzzy North Face jackets and hats, lunchboxes, water bottles and even a music folder — "some kids just don't want to practice their instrument," Golden says. Often, parents can be seen scouring the rack for their child's lost item. If unclaimed, these possessions will live here all year before being donated to charity. But at least still-growing adolescents have an excuse. Sitzman, the EWU professor, says it's about using the same techniques at any age. "The more you can focus on the task at hand, the better you will be at not forgetting things," she says. "Everyone has limits to their attention, but some people can handle more things than others. People don't want to hear they need to slow down, but that's one of the best ways to improve." Sitzman is a huge proponent of lists. She says it's all about developing effective strategies to help improve memory. "It doesn't mean we're stupid if we have to make lists," she says. "It just means we understand our limits of our cognition." A recent research study featured in the Wall Street Journal suggested that people who perceive themselves as forgetful may have a genetic predisposition to do so. But there are still a lot of unknowns in the study of memory and mindfulness, and research is all fairly new, says Sitzman. "We're not in a world that accommodates this, because we want to be able to do everything at once," she says. "With some of our attention issues, it's about having self-control. No, you can't control everything and that's where it can get difficult, but you can get better. You can remind yourself to focus more." "It does smell bad in here," Troyer and Woodard agree, referring to the faint waft of body odor and mustiness permeating the airport lost and found, where we're currently standing. After 60-90 days, these books and belts and everything else will be removed from this space. As dictated by Washington state law, the items are either put up for auction or donated to charity, like the eyeglasses going to the Lions Club. Proceeds from the auctioned items go directly to the airport's general fund. "At some point, we have to admit an item has been abandoned," Troyer says. The airport is like its own city, explains Woodard, which thousands of people funnel through each day. This is the kind of busy place where inevitably people, especially those without a systematic travel process, will leave things behind. Yet the airport works hard to limit stress. "Everything here, how it's laid out, we're trying to soothe people," says Woodard. "Everyone here is going through something, so if we could all back up and slow down, that's good."